Box Text: Look through the Spirit Camera... if you dare. Blurring the line between reality and the supernatural. • Can you escape the memoir's sinister curse? • Battle spirits all around you. • Reveal haunted visions and vengeful spirits. • Enter the cursed pages via augmented reality. 12-24-2015 silverbow Box Text Look through the Spirit Camera... if you dare. Blurring the line between reality and the supernatural. • Can you escape the memoir's sinister curse? • Battle spirits all around you. • Reveal haunted visions and vengeful spirits. • Enter the cursed pages via augmented reality. • AR Book included! This is a list of VGCollect users who have Spirit Camera: The Cursed Memoir in their Collection. This is a list of VGCollect users who have Spirit Camera: The Cursed Memoir in their Sell List. 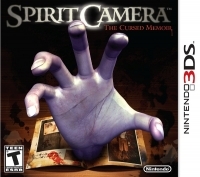 This is a list of VGCollect users who have Spirit Camera: The Cursed Memoir in their Wish List.